For over 60 years Ed and Margaret Reese have been faithfully serving their Savior. Dr. Reese is a Moody Bible Institute graduate. Besides writing, he has served as a missionary, evangelist, pastor, college professor, as well as a consultant to many large Christian organizations. Ed Reese currently is a professor at The Crown College. CHRISTIAN BIOGRAPHY BOOKS - "Hall of Faith Biography Series"
HEBREWS 13:8 JESUS THE SAME YESTERDAY, TODAY, & FOREVER! Would like to help Dr. Reese? Reese Chronological Bible - Great Gift idea! 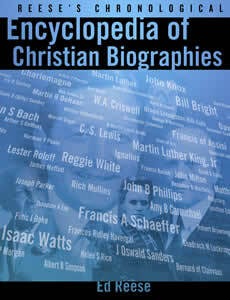 "REESE CHRONOLOGICAL ENCYCLOPEDIA OF CHRISTIAN BIOGRAPHIES"
"To honor these these heroes of the faith is both appropriate and beneficial. I don't know anyone more qualified than Ed Reese to compile such an Encyclopedia. 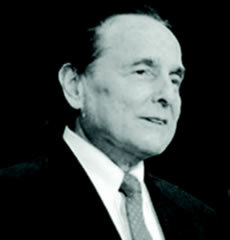 I knew him fifty years ago, when he began his ministry, and have marveled at his steadfastness and dedication to the cause of Christ. 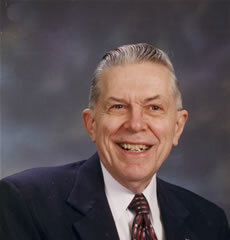 He, himself, is a walking encyclopedia of church history." The Reese Chronological Encyclopedia of Christian Biographies website. Official web site of Ed Reese, Reese Publications, and Reese Religious Research which provides Christian Data and information. Books of author Ed Reese may be purchased. Information on the Christian Biography Series, Reese Chronological Bible, Christian Hall of Faith Series, Reese's Chronological Encyclopedia of Christian Biographies, and Christian Hero cards. Author Edward Reese and wife, Margaret Reese. Website designed and hosted by Web Evangelist Scott Reese. —A lifetime in the making! Now Available - Order your copy now! More detailed information on the Reese Chronological Encyclopedia of Christian History and other works by Ed Reese is coming soon! please BOOKMARK & return. Reese Chronological Encyclopedia of Christian Biographies, christian history, Official web site of Ed Reese, Reese Publications, Reese Religious Research, Christian Data, christian information, books, author ed reese, sale, sales, Christian Biography Series, Reese Chronological Bible, Christian Hall of Faith Series, Reese's Encyclopedia of Christian Biographies, Christian Hero cards, Ed Reese, Margaret Reese, ed reese, chronological, encyclopedia, of, christian biographies, ED REESE, reese publications, reese religious research, christian, data, christian, information, christian history, christian biographies, history of christianity, famous christians, Christian periodicals, church fathers, church leaders, pastors, missionaries, evangelists, christian author, biographies, christian biography series, reese, chronological bible, christian hall of faith, Series, reese's encyclopedia of christian biographies, encyclopedia, christian hero cards. ed Reese, margaret Reese, internet minister Scott Reese, moody bible, hyles-anderson, crown college, crown bible college, youth for christ, world vision, jack van impe, bill gothard, christian aid, cordovox, christian chalk artist, christian books, bookstore, lowest price, bargain, baptist, bible, fundamental, body of christ, christian unity, church history.